After a successful CRM implementation, you will notice a steady (or even rapid) increase in productivity and process efficiency, but wouldn’t you like to quantify your progress? We will now see why CRM analytics is one of (or maybe the most) crucial element for your CRM implementation success. CRM analytics can identify correlations, patterns and trends amongst volumes of big customer data quickly and accurately. The information that you derive from its analysis helps you to customize customer communication for enhanced experience and engagement. Data mining through CRM analytics will aid you to find emerging movements in customer preferences first, thus putting you one step ahead of competition. You can analyze all customer data coming from all touch points including call centers, web, social media etc. Anticipate their future needs, guide product development and create future ready and targeted marketing campaigns and strategies. 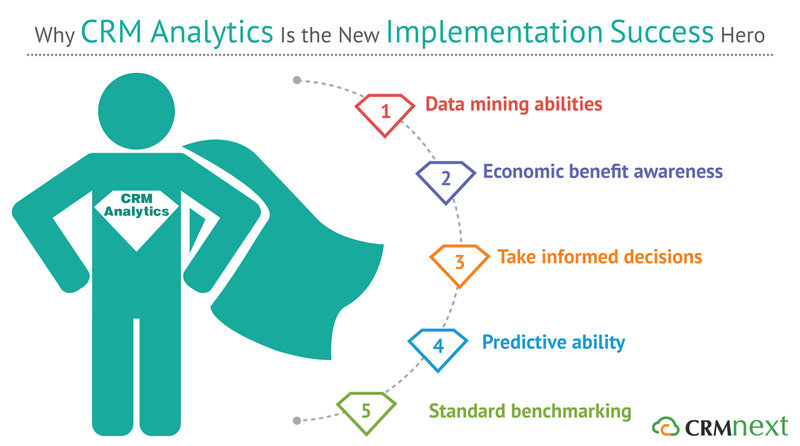 Analytics can help you translate the vague benefits into hard numbers. You can generate and predict present and future ROI. This will help you to justify investments and plan future investment plans as well. Many CFOs struggle to find tangible value despite investing millions of dollars. They ask the question,”Does it make economic sense to put so much resource into implementing CRM?” Answer this question precisely with the help of CRM analytics. CRM analytics gives you a macro view by providing real time numbers to make business decisions. You can gain forecasting abilities about customer behavior with the help of CRM analytics. This is done by gauging their satisfaction levels through surveys, purchasing history, social media notifications etc. The best part is you can identify customers who are at risk of switching over to your competitors. You can then channel extra resources towards winning them back. CRM analytics helps you to create process excellence standards by comparing your metrics to industry competition and peers. We will now see how this helps your productivity and efficiency levels. Based on comparison with competition, you can identify your improvement areas and bring it up to over beyond industry performance levels. CRM analytics may be complex and dynamic, with new metrics added as per scenarios. But it helps to move your organization to the next business excellence levels by optimizing customer touch point efficiencies, targeted marketing strategies and multiplied sales growth.